California state universities, one of the largest higher-education networks in the U.S., will limit the number of undergraduates they accept from outside the state, including foreign students, beginning later this year. A new policy takes effect at the beginning of the 2017-2018 academic year and will limit enrollment of non-California residents to 18 percent of the student population at five University of California campuses: Santa Barbara, Davis, Santa Cruz, Riverside and Merced. The other four campuses, in Los Angeles (UCLA), Berkeley, Irvine and San Diego, have more than 18 percent non-Californian students. They will be barred from further increasing the proportion of non-state residents in the new school year, which begins in late August on most campuses. The state Board of Regents approved the new limits Thursday, following a release of an auditor’s report that said California high school graduates who otherwise were qualified for university admission have been losing out to non-state residents. A tactic the universities adopted years ago — encouraging the enrollment of out-of-state residents, who pay higher fees than Californians, to circumvent state government funding cutbacks — “has made it more difficult for California residents to gain admission,” state auditor Elaine Howle said. The issue was hotly debated before the Board of Regents voted to enact limits on foreign and out-of-state students. Board of Regents member Hadi Makarechian came to California from Iran in the 1960s as an international student. He warned that the 18 percent limits will prompt talented international students to look elsewhere for college. “I know the in thing today is to build walls, but we are building a wall around the University of California by doing this,” Makarechian said. The California state university system, one of the largest in the United States, has about 210,000 undergraduates, about 16.5 percent of whom are non-Californians. Less than 11 percent of the out-of-state undergraduates, about 3,800 individuals, are international students, coming to the U.S. from about 100 countries. Some of the financial pressures that confront the Board of Regents emerged during this week’s meeting: California’s state-run colleges receive about $61,000 in tuition and other fees each year from non-state residents, while state residents pay about $27,000 less. International students who attend public or private colleges and universities in California add $5.2 billion to the state’s economy, according to official estimates. Nationwide, international students add $32.8 billion to the U.S. economy, according to the National Association of International Educators. UCLA Chancellor Gene Block told the regents earlier this year that higher tuition from non-state residents helped the school avoid cuts in class offerings as state education spending dropped. University of California President Janet Napolitano listens during a meeting of the Board of Regents, May 18, 2017, in San Francisco. 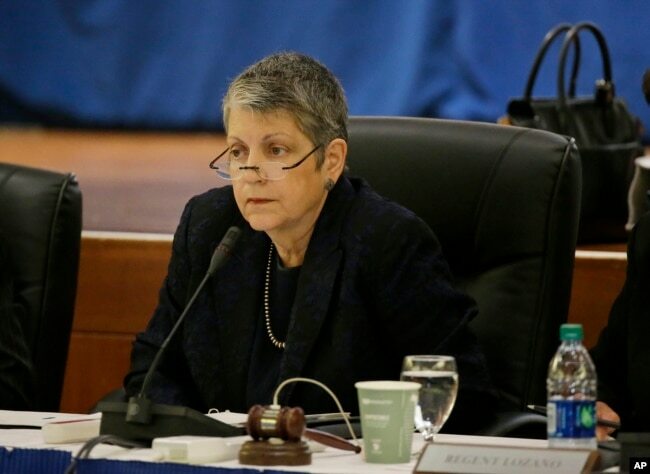 Napolitano, who served as Secretary of Homeland Security under former President Barack Obama, said the state university system still provides opportunities for students from around the world. Competition for admission at California universities is intense. UCLA received 102,000 applications for the freshman class whose classes begin August 21. It was the first time that more than 100,000 students applied. Last year, UCLA accepted about 17,500 freshmen, including about 40 percent non-Californians, or 4,600 Americans from other states and 2,500 foreign students. Overall, the California system received 210,000 undergraduate applications for the 2017-2018 academic year, including 33,995 from out of state and 32,647 from international students, more than 31 percent of the total. Those numbers also reflect a 1.1 percent drop in the number of applications from foreign students. International Graduates Winning Right to Work in U.S.